The demand within the global market for mixed tocopherol has been rising on account of the health benefits served by the compound. The past decade has witnessed increasing popularity of foods that are rich in protein, vitamins, and minerals. For this reason, the cumulative revenues in the global market for mixed tocopherol are expected to increase in the years to come. Moreover, the presence of several research entities that have accredited mixed tocopherol with a mark of healthiness has also propelled market demand. Mixed tocopherol consists of compounds that are rich in vitamins, especially vitamin-E. This factor is a key consideration in gauging the growth dynamics of the global market for mixed tocopherol. The compounds and minerals present in egg yolk, leafy vegetables, and wheatgerm oil are found in mixed tocopherol. Mixed tocopherol can also act as an effective anti-oxidant which has further given an impetus to the growth of the global market. There is a recurring demand for mixed tocopherol in multiple industries including food and beverages, medicine, pharmaceuticals, and nutraceuticals. There is also heavy demand for healthy food supplements which has in turn propelled market demand for mixed tocopherol in recent times. The manufacture of several food products involves the use of varying classes of tocopherols. Transparency Market Research (TMR) finds that the global market for mixed tocopherol would expand at a stellar CAGR of 4.6% over the period ranging from 2016 to 2024. 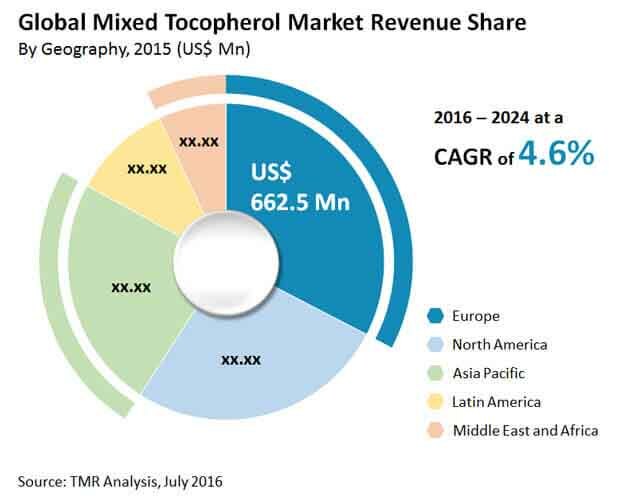 Furthermore, the total valuation of the global mixed tocopherol market is expected to reach a total value of US$3.04 bn by 2024. The market for US$3.04 bn by 2024 had a total worth of US$2.03 bn in 2015. Transparency Market Research (TMR) gives a wide purview of the global mixed tocopherol market in a research report. The global market for mixed tocopherol is segmented on the basis of product, application, and region. On the basis of product, the global market for mixed tocopherol is segmented into beta tocopherol, delta tocopherol, gamma tocopherol, and alpha tocopherol. Amongst these, the demand for alpha tocopherol is in great demand due to its direct usage in the manufacture of multiple food products. Based on application, the market for mixed tocopherol has been segmented into animal feed, dietary supplement, and pharmaceuticals. Amongst these, the market for dietary supplements has been expanding at a stellar rate in recent times. This owe to the rising propensity of the masses towards leading healthier lifestyles. Furthermore, increase adoption of pets has led to an increase in demand for mixed tocopherol for animal feeds. The global market for mixed tocopherol has been segmented into North America, Latin America, the Middle East and Africa, Asia Pacific, and Europe. Amongst these, the market for mixed tocopherol in North America has been growing at a boisterous pace. This owes to the fact that animal feeds are bought by several people in the US and Canada for their pets. In the US, every third family has a pet animal which is a key consideration from the perspective of market growth. The market for mixed tocopherol in Asia Pacific has been rising on account of an expansive pharmaceutical industry in India. Some of the key players in the global market for mixed tocopherol are DSM N.V., B&D Nutritional Ingredients, Inc., COFCO Tech Bio Engineering, and Advance Organic Material S.A.
Tocopherol, alternatively known as vitamin E, is a naturally occurring organic element that can be obtained from a variety of vegetable oils and food products such as spinach, nuts, almonds and tomatoes among others. Tocopherol have the ability to protect from various diseases such as various neurogenic problems, restless leg syndrome, Parkinson's disease, Huntington's chorea, lungs cancer and oral cancer among others. Thus it is increasingly used in various pharmaceutical industries in order to provide proper medication against these diseases. The global mixed tocopherol market has been segmented on the basis of product type, application and geography. In addition, an exhaustive country level analysis of the global mixed tocopherol market across four broad regions has been covered under the scope of the study.